Print Page - DANLEY Sound Labs TH-115? Title: DANLEY Sound Labs TH-115? Title: Re: DANLEY Sound Labs TH-115? Title: TH 115 Sub-Driver looks like an RCF?? Title: Re: TH 115 Sub-Driver looks like an RCF?? I also don`t know how to get that extra loading under the passband off the horn. I you look to the impedance chart of the TH115 i think that the first two resonantpeaks from the right are those from the real horn. The one on the left must have a relationship with the pressure that comes from the front of the speaker. The pathlengt of the horn must be calculated in otherwise you could not get the resonantpeak at the point you wanted to be if you model this type of loudspeaker. But if you calculated it with only the speed of sound, like you mentioned, you could not see a relationship between the pressure on the back of the driver and the pressures that comes from the front. Now i am not to familiar with phase, but it could be that some delay is accounted in that is caused by phaseshifts. I don`t know what the phase will do under the passband of the horn. And can real acoustic phase be modeled with a equivalent circuit(Leach). At the time the speaker is moving backwards there must be pressure on the back of the diagram, at least i think so. When the full pressure(from the front) must come on the back of the driver i don`t, maybe at the time when it`s going back or maybe at his neutral position. This pressure could be calculated like a sort of back emf in the acoustic circuit, just like the acoustic/mechanic circuit introduce the back emf to electrical circuit. Maybe i am totally on the wrong road, i am just trying to understand it with logical explanations. Ps. my englisch is not very good. Im really interested in this stuff too. I expect some FEA would help. A bunch of people asked questions, I will try to answer. I don’t think it would be fun or fair to just explain how to build a Tapped horn although Walt seems very close. Rather, what I can do is to mention a few “clues” or things, which lead to the approach. When working with the Unity and later Synergy horns, it was clear that the acoustic passageway called a horn could be driven from a location other than at the “small end” with only a few differences in operation, all of which can be modeled. The bass reflex approach provides a phase inversion (at resonance) which allows the rear radiation to be additive with the front. This approach depends heavily on a high Qb in order to have a high Q in operation, horn loading a port produces a significant acoustic load which greatly alters the Qb. Bottom line is the port stops working properly if significantly loaded by the horn. The real problem with a horn that is too small is that the radiation load presented to the driver changes too much vs frequency, in a perfect horn (the kind assumed in horn theory) the radiation resistance is constant. Peaks in the output are normally associated with dips in the impedance which causes “more” power to be delivered, producing the peaks. The Tapped horn approach can be smaller because at the low cutoff, the drivers appears to have a smaller radiating area (but the same motor), which raises the electrical impedance, lowering the peak. Above the low cutoff peak, the driver can appear to have as much as twice its original radiator area (still on the same motor) which raises the dip by having a greater area / load. The idea in the patent application is that the drivers acoustic source impedance tracks the horns acoustic load impedance (when everything is right) which results in a MUCH flatter response and greater efficiency than a conventionally driven horn the same size could produce. One cool benefit of the approach is seen when one compares the group delay of a Vented box and Tapped horn with an identical low cutoff. The PB-12 tower for example has a measured group delay which hovers around “zero” down to about 30 Hz. A vented box with the same low cutoff would already have about 10 –12 ms GD at 30 Hz. One can picture the effect of GD more clearly when you recall that this is like moving your speaker to the rear in time at a rate of 13.5 inches per millisecond of delay. The other effect of the Tapped horn can be realized when you consider that alone, the driver in the Tower has a sensitivity of about 88 dB 1 W while it is a minimum of 95 dB 1W 1M when in the Tapped horn. If you guys are inclined to and are near Atlanta, call the shop and go get a demo and see what you think. Stephan, So far as why is the Sky Blue?, I would guess it has something to do with the fact that liquid oxygen is also sky blue. Liquid oxygen has gotten a bad rap too, look what you can do with it. Hungry? Fire up the bbq. Yumm. I'm still struggling on the tapped horn but I do know why the sky is blue. Dust in the atmoshphere scatters the shorter blue wavelengths in sunlight to a greater degree than the longer red wavelengths. True, but the link is more fun than talking about Rayleigh scattering. Is it usefull to look at only the m/nodal behaviour of a pipe fired into one end with a rear chamber "tapping" into this pipe (tapered or not) at a position/positions conducive to your requirements? The "tap" if caught at a pressure maximum would act like a flute and dampen an undesired mode and likewise for the driver's relative poition to the closed end of this pipe and one has to go and position the driver and "tap"in a geometrically fortunate position? The braodband dampening would be similar to an open tranmission line due to the signifficant differene in arrival time of the rear-wave? By using the correct boundary values you will find that X(x) describes the modeshapes in the horn. T(t) gives the timeresponse. For a non-constant cross-sectional area solving this partial differential equation is not easy but it can be done. In fact the principle of 'nodes' in a transmissionline is a result from solving the wave equation. I think most people don't realise this. If you know whats behind the obvious (logical) theory of nodes it much more easy to study new principles such as the tapped horn. Perhap I'm not fluent enough in group delay but I don't understand how it can "hover around zero" when measured outside the enclosure. Isn't there some delay at least based on the distance of the driver from the mouth? Might it make more sense if it was stated as "was pretty much constant" through the stated range? Most measurement systems allow you to define some t0 to get a more useful view of the data, and in some cases, to make the measurement possible at all. Effectvely you are just removing the time of flight, or fixed delays in the system. In most LF systems that time of flight is greater than the physical distance from speaker to mic, and even more so in most bass horns. Mark answered the question but I can give a bit more explanation. Group delay began as a descriptor of the difference between the delay at one frequency compared to another. The fixed delay component, related to time of flight and driver internal delay is not part of Group Delay. As a result, a drivers GD is unchanged by changing the mic to speaker distance. While a horn can have a larger fixed delay (due to the additional path length), they can also have less group delay than a direct radiator / vented system, as in the PB-12 Tapped horn. The part about GD which may not be obvious is that all filters have group delay too, not just a speaker. In fact, any normal filter than changes a signal’s amplitude, also produces GD. And those filter group delays are always negative. Never positive. Unless you live in some alternate dimension or you pre-delay everything and digitally treat it. But then everything is later. And the higher the rolloff, the higher the groupdelay. The clues that Tom gave us about the tapped horn are very usefull. I never looked it that way. From the post`s that Tom and Mark placed in the past about, aspecial the one`s of the unity horns, i learned a lot about phase/time issues, still i have questions about this most important subject. The textbooks i have don`t give me the answers so maybe you guys could fill in. Correct me if i'am wrong. I am totally confinced that a speaker can only produces the exact same waveshape as the signal you supply it if you have absolute zero phase and a flat amplitude respons. Other words; the position of the speaker is exactly the same as the "point" is in the signal, so no delay. - The internal delay of the speaker itself. This last delay is my biggest problem when i am trying to design the "perfect" speaker. I think this delay is the difference in measuring a speaker with a TEF machine (conform TDS) and most of the other programms that don`t measuring the absolute acoustic phase. Is this delay frequency depending or is it a constant delay? And what can a speaker tell us about it if we looking to his parameters or it construction? Most of the diy-ers can`t afford it to buy something like the TEF machine, but what can be done to make the ideal speaker? And how far must be go, if we talking about the perfect speaker. For example; must the phase delay of a mic. also be counted in when measuring a speaker? Ps. : with the ideal speaker i mean it`s going to act like the way you wanted to act. Where do you get them from? I have never seen them anywhere for sale on a good site like http://www.NorthernSound.com that deals in the really good stuff. In your description of the Electro Voice mains that you have, those drivers are not "sub" drivers but 'woofers' or 'midbass'. Also, when you add the Danley horn subs, make sure to mention that they are Danley TH-115 Tapped Bass Horn Subwoofers. He got them directly from Danley Sound labs. Just as anybody can. yah, ordered directly from danleysoundlabs.com. tho im worried about them making it to sf in time for my oct15th gig , ugh. good lookin on the woofer/sub description. site needs to be updated like MAD! haven't done so since summer... soooo many changes since then. anyway, i bookmarked this forum, so you might see me posting more. We at Danley Sound Labs are developing a new website which will reflect the world beating products we are producing. That being said the existing site has been updated multiple times even within the last month. Examples being, SH-50 with measured data, the TH-Vortex with measured data, and all new product pictures on the downloadable .pdf's. As to the question of where to buy, let me make it clear Danley Sound Labs is developing a dealer network which will eventually handle all sales. Being a new company our distribution is not highly developed and sales inquiries are handled in house. Please understand though that if you are an end user Danley will sell to you only at Pro User Net. Tom said that the high Q loading a port stops it from working properly in this instance and I read on a couple of sites about this karlson slot loading stuff affecting a wider bandwidth by varying its loading over frequency. Its something to do with a exponential or hypex curve cut out of a baffle in front of a driver with a ported chamber and slots and other stuff... basically im not sure how that all comes together as its very hard to find any decent info explaining it. It seems pretty easy to simulate an "ideal" horn in mcbean, but that assumes that both entry points are receiving the same signal. Which got me thinking, would 2 drivers, each loaded at the 2 separate points have the same effect or any gains? My first thought about the K coupler is that the principle could be applied to an undersized horn mouth to reduce ripple caused by reflections. Fairly sure this is not what is happening in the tapped horn designs though as it would be visible. Do you think it might be possible that the horn throat is shaped to give frequency dependant loading? I think the tapped horn uses Helmholtz cavities on the throat chamber or down the length of the horn to smooth out the peaks that would otherwise result from an undersized horn mouth. Not sure how to model this so I might try drilling some holes in one of my Labhorns and attach some cavities to the outside to see what it does to the response. Does the Karlson design actually help improve sound quality. It looks like it was able to improve impedance a little. I noticed Ivan Beaver Had a few of those in his sound system back a few year ago. Anyone take any sweeps of those things??? Phil, I'm pretty certain the shape of the throat is the key to this riddle. I was looking at some simulations on a webpage about horn theory and thought a particular sim showing a narrowing and widening of a section causing a ripple in impedance might be along the right lines. Maybe its like a tuned vent except the varying cross-sectional area loads a wider bandwidth. Maybe I'm completely off-track, i'm not sure! Anton, i've not been able to find much on the karlson coupler and a lot of comments have been negative to its sound quality although given the time period in which it originally emerged i don't think its reliable evidence. Still seems like an interesting idea though, i'd love to see a more in depth description of how it actually works and what is loading what!! karlson cabs were designed as FULL RANGE home stereo cabinets, not really as sub or bass boxes. They originally had 12" CoAx or Full range speakers in them. Many folks started to use them as bass speakers because they had a pretty smooth response in the low end. If memory serves me correctly, Ivan had Maryland Sound "Clams" in his rig. These were a slightly changed version of a Karlson cab, used as subwoofers. The Clams used a 15" speaker instead of the original Karlson 12, and were designed to be used as Bass or Sub cabs, not as full range cabs. A single was basically a 15" version of a karlson (but some of the dimensions were changed slightly). A Double Clam was basically 2 karlsons in a single box. A QUAD CLAM was 4 Karlson in a single box. I had 2 doubles and 2 Quads for a while, but never liked moving them around. They were very heavy, especially since mine were fiberglassed, and loaded with Gauss speakers! Back then, my version of "SWEEPING a cabinet" was dusting them off with a broom before a gig! I'm not sure what they would look like on a scope, but they do sound pretty good. Dave Smith of MSI was the guy who really liked the Karlsons. He had a pair of 12" on his home stereo, and 15" versions on his own PA. I liked the sound of his home stereo with 12" coaxials loaded in them. I've also heard a pair of 15" karlsons loaded with Tannoy coaxials. They sounded great!. My buddy Sheldon still uses a single MSI Karlson in his livingroom corner as a subwoofer under his Tannoys. Yeah its interesting looking, It looks like the cross section of a exponential horn stuck in front of a speaker. I just wonder how effectively it actually loads the driver. My father was telling me about another company that was making compression driver lenses with a similar slot expansion in it. Hmmm I wonder if his concept was actually as valid as he thought. It was called "The tube" and came out in the late 70's. It was a horn driver with "the Tube" attached to it and it faced straight up. The tube was like a plane wave tube with a slot "looked like the carlson" cut into it. I think they didn't take off because of the lack of sensitivity. I only heard them once in a very small room with a lunatic guitar player. I don't remember how they sounded-the show caught my attention. Wow, it’s been a while since I thought of them. I’m surprised Al Limberg didn’t post because he had a set. I heard them used outdoor. They were mounted on a set of Gauss HF-4000 2” I believe, but I could be wrong. They were used in a 2-way system with a set of Community Leviathans (dual 15” on a straight horn). So you had these big fiberglass horn loaded dual 15” enclosures with a compression driver laying on its back on top and a short tube attached pointing straight up. As I recall there was a cut on top at an angle. The most memorable characteristic was they had almost no vertical dispersion. Now I feeling really old. 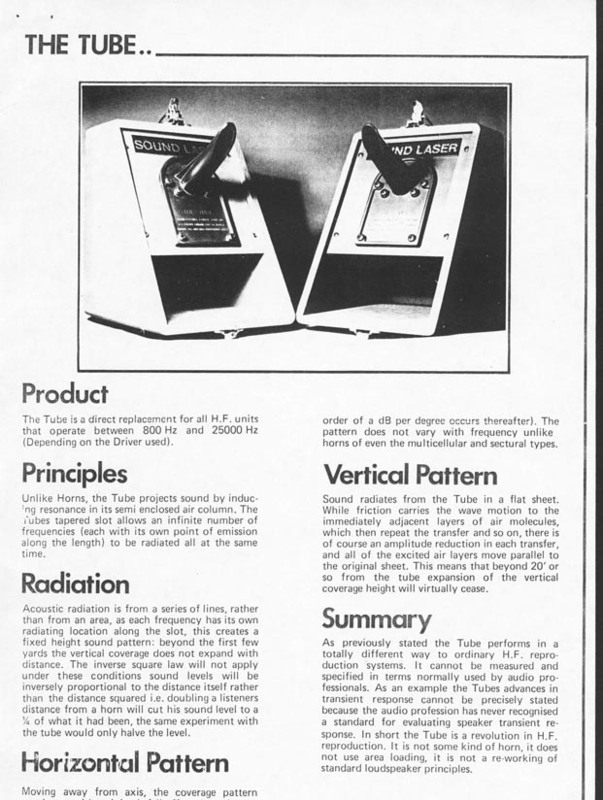 My late friend Bill Kelsey used the Tube in his C System design for TFA ElectroSound here in the UK in the late 70's/early 80's. It was a 2 box system, bass and mid + Tubes. The bass had 4 x 15 reflex loaded. The top box (same size as bass) had 4x12ins and 4 Karlson Tubes with 1 inch compression drivers. The tubes were arranged alongside the 12's, vertically in two pairs with the tube ends in each pair touching at something like a 45 deg angle. The idea was to have a vertical line of bass and a vertical line of mid/hi. Yes, a line array in 1980! To me, when set up properly, it was the most hi-fi system that I have ever heard until my experience with planar/ribbon hf systems. Of course TFA had people like Ted Nugent as customers, so volume not Hi Fi was the order of the day. The only problem as I recall, was that it used EV drivers, which at the time were not the power monsters we have today. Also people would insist on stacking mid/hf cabs side by side. The dispersion of the tubes was about 100 degrees, so you can imagine what the comb filtering was like. Had to be heard to believed. Just ask Mick Whelan (EV). In the mid 80's I worked with Bill on developing a 2inch tube, but we had insufficient funds to go anywhere. 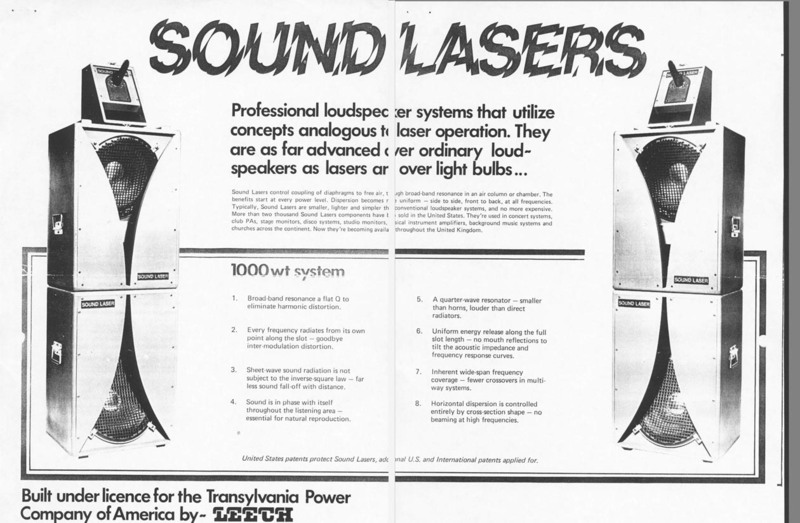 Just like the compressed air powered bass cab and our early line array. A familiar tale to many, I guess. Still have my pair which I used with Altec 808Bs. As I recall, they sound fine when I'd use them with a sm/med club system above 2482s. Better than the (stolen) slots others used. Iain, you think you're feeling old. I knew I had seen and also read about the TFA Electrosound system in the late 80s/early 90s, but have not heard hide nor hair about it since and thought it was my imagination playing tricks. If I remember correctly, the system was also used by Elvis Costello at the Royal Albert Hall and was given (absolutely correctly in my opinion) rave reviews for the sound quality. The whole system was, if I remember correctly, driven by BGW amps for low and mid, and I have a feeling that Quad 405s may have been used for high end. Didn't have the chance to move around the RHA but from my ground floor seat, it sounded great - certainly not like any of the then prevalent systems (Martin etc). I remember the “Tubes” but never understood how they worked. Phil Pope’s post above had a link, at that site I found some pictures of the tubes and Karlson coupler, called a Khybo or something here. Like the tube, the karlson coupler is an intriguing arrangement. One can find configurations of radio antenna’s that remind one of the Karlson, yet acoustically, my gut reaction is that he was on to something but not quite all the way there. I had fully shelved the concept mentally until the last few years when a DIY’r named Freddyi kept posting links and photo’s and occasional measurements of them. Now its in the “more of an unknown quantity” box for me, but like an antenna, I am sure the acoustical geometry / sizes are the key to making one truly broad band if that is possible. Iain, I don’t know if you did Ted’s sound in the USA a bit earlier but in 1972 or1973, I was a bass player in a band that warmed up for Ted N. concert. It was kind of funny, maybe that’s not exactly the right word. I worked at a small speaker company called Steamer Sound at the time, for the gig, I borrowed every working speaker we had and the PA system we had on hand. Anyway with all the boxes, we were able to fill the stage edge to edge with 4X12 Steamer boxes 2 high and we had an “out door” sized PA on the sides (2X12 80Hz horns and a number of big Altec multi-cells and 511’s. That was powered (mostly) with home built 200W Tube amplifiers based on the Sunn 2000S (and dynaco) output stage. It was great fun and a great gig for the band, the best part was a standing ovation. The next best part was Ted’s brother (I think it was) asked if they could use our PA, for me, that was just as cool as the ovation. “AAHHH, we hit the big time”. Well, I still build speakers anyway. Nostalgia lamp off, its getting too smoky in here. I seem to remember that the system was sold to people who had a connection with Paul Weller post Jam. Supposedly they changed the tubes for regular horns. I do remember Bill showing me Quads on the HF. (I didn't work for them, just introduced by friends. "Hey Iain went to college, and he knows how to use a scope. Oh, better meet Bill then") The system was reviewed in a number of magazines. The Tube seems to me, to simply be, a 'broadband' resonating tube with a variable termination. Have a look at the Patent documents they give some insight to his thinking. No thanks. I didn't do sound for Ted. At that time I was still going to college. Even then I wanted to preserve my hearing. It was stupidly loud. Like enough to cause your eardrum to flutter. His FOH was a crazy American, who publicly claimed, that he could kill the audience by moving a few faders. Ho Hum.. Communication was reputed to be, by line of sight. here's a bit of rough diy K-stuff - will have to gather up links to plots and gather data on Transylvania's Tube when weather permits. does anyone here have info on K-stuff not seen at Ulfman's? - or diy Karlson coupler data to share? Karlson's list of inventions 1950 - note "controlled reverb" aspect of the coupler. -believe it occurs in tubes also. 1. ELECTRONIC POTENTIOMETER. A variable element which is capable of linear variations of resistances with infinitesimal mechanical motion yet also have capabilities of broad variations in resistance. 2. CAPLESS DISPENSING TUBE. This device permits the use of toothpaste tubes, etc. without the necessity and bother of removing and replacing the cap after each usage. 3. GEOLOGICAL PROSPECTING SYSTEM. A system for use in the prospecting for oil, minerals, etc. This system may also be used for radar applications. 4. RADAR ANTENNA WITH AUTOMATICALLY VARIABLE BEAM PATTERN. This invention provides a simple means of automatically changing the beam pattern of a radar antenna from a pencil beam to a cosecant beam. 5. DIELECTRIC ANTENNA. This invention provides a technique for designing commercial and military antennas which will have overall dimensions than conventional antennae, and yet have equivalent gain and directivity characteristics. 7. ASHTRAY. An extremely simple design for an ash tray which quickly extinguishes cigarettes. 8. PRECISION DELAY CIRCUIT. This circuit provides a delayed pulse at a precise interval following an initial pulse. 10. TELEVISION ANTENNA. This invention provides a simple, low cost antenna which can be readily hidden or obscured in the average room and is suitable for both F.M. and television. 11. SLOT ANTENNA. This design provides a slot antenna with broad band matching possibilities. 12. HYBRID WAVEGUIDE JUNCTION. This is a wave guide section which has variable propagation characteristics dependant upon the direction of propagation. 13. R.F. TUNER. a simplified tuner for F.M. and television use. 14. ADVERTISING SIGN. Novel electric sigh with quick change possibilities. 15. LIGHT VALVE FOR TELEVISION PROJECTION AND PICKUP TUBE. 16. ACOUSTIC TRANSDUCER. A novel loudspeaker enclosure with improved matching characteristics and controlled reverberation. J.E. Karlson “Acoustic Transducers” US 2816619 filed Dec. 1951, granted 6 years later - probably due to RCA/Olson filing one - Karlson won. J.E. Karlson “Open End Waveguide Antenna” US 3445852 filed 1968 - essentially analogous with the K-tube waveguide used in Karlson’s X15 2-way speaker ~1966. J.E. Karlson “Acoustic Transducers” - US 3540544 filed 1968 - concurrent with X15 and described Karlson’s use of ellipse based reflectors. J.E. Karlson “Jet Engine Silencer Nozzle...) US 3543876 filed 1968 - jet engine muffler and rocket nozzles. thanks for the interesting post. Like the look of those clams in particular. Can clearly see the 1/4 wavelength peak associated with the full chamber length. Am I right in thinking that Reams' Karlson-Hypex is essentially a clam chamber loading a variable expansion horn? Hi Phil - re: klam 18 made from one 4x8' sheet - not sure about 1/4 wave or BP peaking (?) - front is about 24" deep from nose to baffle - also there's a matter of microphone perspective vs its aperture affecting plots. subjectively in a modest size room, theres large changes in sound with small changes in aperture flare and/or gap. -- don't get much building done and lack math ability to digest some forumla but there's some K-guys who run 4-5 sets of CNC-ed wings and many variables per coupler. Here's some impedance data on that klam before adding 0.6lb/cu.ft. polyfill to its ~85l chamber which lowered qtc to around 0.84 or so. plugging the 2nd Z peak into winisd as BP4 front chamber tuning superfically looks similar. I was wondering whether the Khyboe could be modeled as a Voight Rubber Throat. hi Iain - one might look at Poppe's paper. discussion with a k-builder suggested making an impedance measuring tube (with 2 mic method rather than traveling wave type) to mount in place of a Karlson's driver. a damping control. I have the factory 1955 blueprint and one exmaple. This Karlsonette could also be laid on its back to fire into a wall for "Aural Optics" and an optional spaced glass top available so it could be a bar! - this size coupler will kick some snappy midbass with lower Q woofer. who was involved in this "collaboration"? - did the late Dan Armstrong have intentions of reviving some K-stuff? I think that the Khyboe and the Tube are different in their treatment. To start with, the K tube can be considered as a resonating pipe. Then you can expand the complexity of analysis, like Poppe. The Khyboe (Bass) is different. The front of the driver has a short loading section with rapid flare. The rear also loads in to the front flare. Maybe I'm wrong, but looking at the picture links, I don't see that you or others, use the rear radiation of the driver, either by rear horn section, rear pipe or reflex loading. Why? You are missing 50% plus of the design concept and significant output. Hi Iain - my Karlson are usually vented - sometimes with side gapped vents in the reflector which can't be seen directly from frontal view. I believe I have a drawing that I made of the Maryland Sound 1/2 clams that I had. I will see if I can dig it up. These were the concert versions. OK, glad I was wrong about the vent. But I am still thinking that the analysis of the Tube is going to be different to that of the Khyboe(Clam). Acoustic - Well well... I seem to remember them producing a motor driven sub. It never made it to the UK. When was/is this 115BK produced. The Leech product had a huge vent, the width of the cabinet. Fred Walecki at Westwood Music LA used to build Karlson cabs for bass players. Fred told me that his cabs were a direct copy of the original. Nicely made and very solid. I would agree the tube and “box” version are different. In Freddyi’s post of Karlson’s patents, I see he played with antenna’s too. This makes me sure that was the direction he was thinking as I have seen a balanced antenna which made me think, huh, a Karlson. There are some amazing parallels between radio waves and sound but also some major differences. For example, with an antenna, one reaches the radiation impedance of space with a wire a quarter wavelength long perpendicular to a ground plane (a mirror image). One can couple into that space at about 4X the impedance with a balanced (0 and 180 degrees) antenna made of two quarter wave lengths (half wave length overall). For sound, that same “flat part” of the radiation curve is a function of area not conductor separation. .
Where a horn I think is a variable resonator (above the low cutoff frequency) and like an electrical tank circuit can transform impedance’s from one end to the other, I do not see that in the box version of the Karlson, at least at low frequencies. My guess would be that it is an acoustic low pass filter, which may have gain at the higher end of its response. A danger in drawing a conclusion from “close up” measurements is that when one changes the size of the radiation aperture, one can see differences in the sound level near field that are not related to acoustic power and would not show up at say 10 meters. My hunch would be that if one measured the “box” version at 10 Meters, one would not find the “slot” increases the LF acoustic power (over some other shape), none of the dimensions are like what is needed down low. On the other hand, like any acoustic low pass filter, it will lower the distortion of the drivers output where it is rolling off. Also, unlike any simple port used to make a low pass filter , one does not see organ pipe resonance’s, rather internal box modes mostly (it looks like) up high. The Tube on the other hand is acoustically large enough in some of it range to do something unique. Exactly what I’m not sure, I’ve never seen a sensitivity or polar information on them. If it were also a variable resonator, then it could also provide an impedance conversion like a normal horn. I do know that there is nearly always “another way” to solve a given problem and in antenna theory, there are things that look reminiscent of a Karlson and the goal of them is to provide a constant impedance over a broad frequency range (Freddyi, that book turned up). I suppose the thing to do would be to figure out how to model something with few enough segments and small bandwidth to work. Iain, in that earlier post about Ted N., our PA wasn’t that loud, we had about 800Watts of mostly Tube amplifiers. We played with Ted after Journey to the center… but right before he got big the second time. I was 20 at the time so to me he was a scary fellow, although his brother was similar looking but a normal guy to talk to. I found a link to a photo of the speakers we had in the PA and Gary Gand had one of me working on one of those tube amps back then fwiw. Acoustic did make a motor driven woofer briefly, a subtec 2.6 or something. This was an attempt to make a Servodrive but by using a crank throw, added the cosine distortion such a mechanism imposes. I was pleased with Servodrive motor system, man its hard to believe that was 20 some odd years ago now. It did allow T&S parameters which one couldn’t make with a VC driver though, a key to making the horn work. An interesting comparison can be drawn between the most powerful Servodrive, the BT-7 with uses a servomotor driver and conventional horn and the originating subject of this thread, the TH-115, which uses a conventional driver but a new horn configuration called a Tapped horn. Four TH-115’s and four BT-7’s have about the same sensitivity / efficiency, the BT-7 is rated at 400Wrms, the TH-115 @1000Wrms. The 4 BT-7’s are flat to about 32Hz, the TH-115’s to about 35Hz. The Th-115’s, because of the different horn are about half the weight, cubic volume and cost. Like I said to an old Boss, “there is nearly always a way to go around, under, over or bore through a technical problem”. I think that is what Mr. Karlson was thinking too. 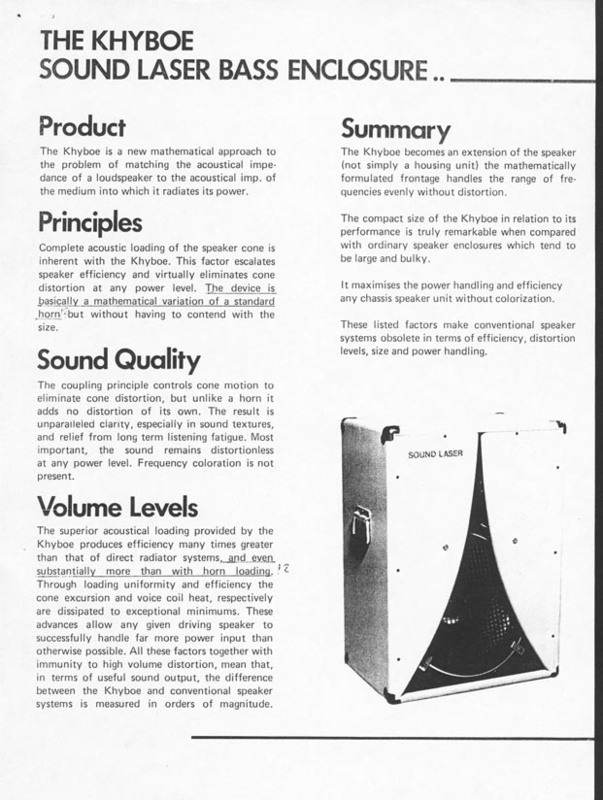 Anyway, the Karlson is a curious acoustic device, a better understanding and refinement of the various dimensions and shape could I think lead to something new also. re:Acoustic Control 115BK - had large vent ~3" high by 9" wide - IIRC Z-minimum with EV15L is ~56Hz so there's probably some pipe action besides added mass-load on vent from coupler. 30vrms 50hz for K-box - careful not to smoke that coil! Rough side-view sketch of that 8cu.ft. k-coupler - its vents are 4.5"
holes on the 1st reflector panel. one board and an upper piece would probably be as good for midbass work. It started as a 15" coupler but got bored and took jigsaw to it to see what it would do with 18"
I'd normally tune this k a bit higher for a riper upper bass and nice shockwave effect. also like it as took one sheet of cheap plywood and weighs about 70lb loaded vs nearly double for the Unity. John Karlson musta had good relations with Robert Moses as K15 (probably with EV 15RTX) was used in several exhibits at the 1964-65 World's Fair including Ford (with Disney Animatronics) GE and other exhibits. a reliable source says Karlson did a rocket mic-speaker install for Moses and in abtract way reflected the twin-towers project. I have built and used various Karlson couplers for PA since 1983. There have been 15" and 18" woofers in 2'x2'x3' Karlsons of my own design. use with a K-coupler for the highs. They get ugly above 175 hz. and require a crossover set from 100-150 hz. The key to its low freq. performance is the coupled front chamber. The increased air pressure loads the cone and dampens it. Carl says mass loading changes T-S parameters and evaluates up to 5 sets of wings (whew) - by his critera a Karlson bass coupler would not have a large rear chamber. if feel up to it - do some plots of Transylvania Tube in 15 degree increments at several heights. re:K-Tubes - x15's tube imo has a significant ammount of energy propogated perpendicular to its long axis so theres a fairly high and even vertical window. like to get rid of that 2K2 notch - maybe wasn't as deep with 806a(?) was it from a diameter transition of a 1" OD 30 degree slice pre-waveguide to 1.875" ID tube? Karlson presented two circuit models for the coupler in 1952 Audio Engineering article - separate circuit for LF. what type of Z tranformer (if any) is an Ultra-Fidelity type Karlson? - some couplers seem to have high outputs with good cone control. there could be BP action - but is there more? can some K-couplers be made to work stronger within their passband for a given bulk by allocating more air-mass load from front chamber so rear chamber isn't quite as large as 5181's approach? - thoughts? Yes I have heard the Servo product. For a short time,(and not short enough for me) I was part of the company that imported Servo product to the UK, 1988 approx. We had 12 x SDL 5. They were sold to a "rave company", and the last I heard they were still working. Now I know why you moved south. Hey Iain, Tom and guys - IIRC there were other Karlson-types in the 1970's - around 1971 I saw and heard "something on a pole" outdoors in a small venue which wasn't standard Ultra-Fidelity type nor klam-projector 'ala JEK AP and JEK's Oliver-Projects - wonder what those were and what called? - didn't look DIY but could have been. Anyone got to grips with the Poppe paper? I managed to struggle through the Marshal Leach horn paper but the Poppe paper is a bit beyond me. Got some spare Ciare 12.00SW drivers sitting around so I am going to try a 1.8m Klam and see how it goes. Hoping to get down to around 50Hz. Anyone know how LF cutoff is related to length and cross-section area at both ends? What sort of T/S parameters are suitable for a Klam design? Is rear chamber volume important? Hey Phil - you'll have to contact and engage Carl into some practical directions as to what will happen as he's built a number of AP-style klams. I'd think be some coupled-cabity type action to account for part of its response. Ciare should be nice driver. you mention Carl in one of your other posts but where would I find him?